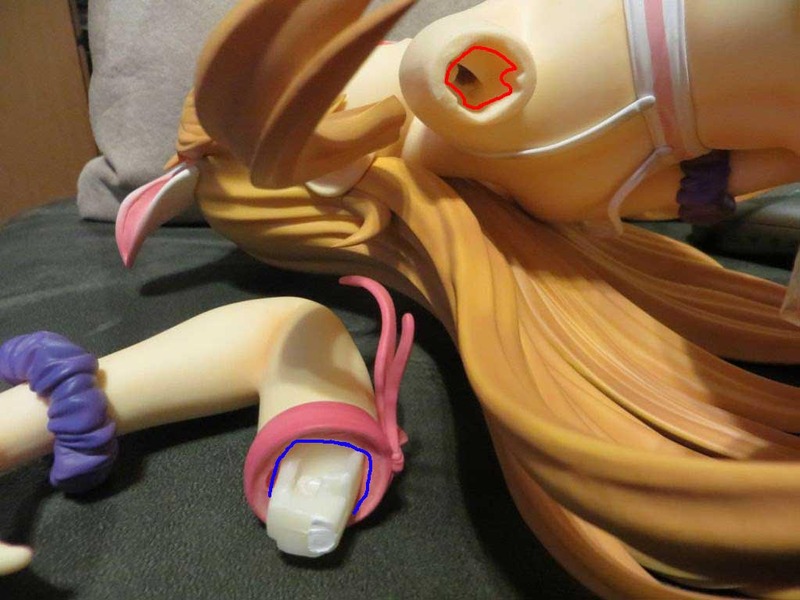 I bought the Kirino Super Figure(ITEM #254347), the Soft Bust version, and last week it was delivered. Per my usual routine I took pictures while I opened it to which I'm glad I did I suppose. The problem as you'll see is that her right arm was detached upon opening the Styrofoam case she comes in. I find Styrofoam to be a poor choice for containing figures but that's only due to my continuing unfavorable experiences with them. You'll see in more detail the breaking point. Most of her upper body is a soft rubbery material including the sholder/arm area up until it changes into the arm that broke off. So you can stretch the shoulder hole to see inside but even so its mind boggling to try to understand how the arm was originally attached. Even though I see a break mark on the arm piece I don't see anything like it inside the shoulder, nor does it line up anywhere once I try to place the arm back with the hand; which should be glued to the side of her chest. So my inquiry to you: I wonder if anyone could share their opinion or offer suggestions on how or what to do/use to secure her arm back in place. Glue doesn't seem to be an option because: I can't see where what I'd be gluing and there really aren't two specific points I have to even attempt to glue together. Anyhow, can't you 'just' drill a hole large enough for a small metal rod acting as a guide and stabalizer and so getting it re-attached via two component super glue?! No way man, I would be even more livid about your issue. The part with the hole on her isn't even the soft material so how could they have done that? That's terrible. It seems the quality control with this version was lacking. I'll tell you one thing, I do not plan to ever buy a soft bust figure again. I only bought this one because the normal version was sold out and I had to buy it at that exact moment to get a great deal. IMO the the "soft bust" isn't all that special after experiencing it myself. I plan to wait to hear back from my shop for what Griffon says they plan to do about the issues. But at least now with these ideas on how to repair mine, as long as I do it right it shouldn't even be noticeable. 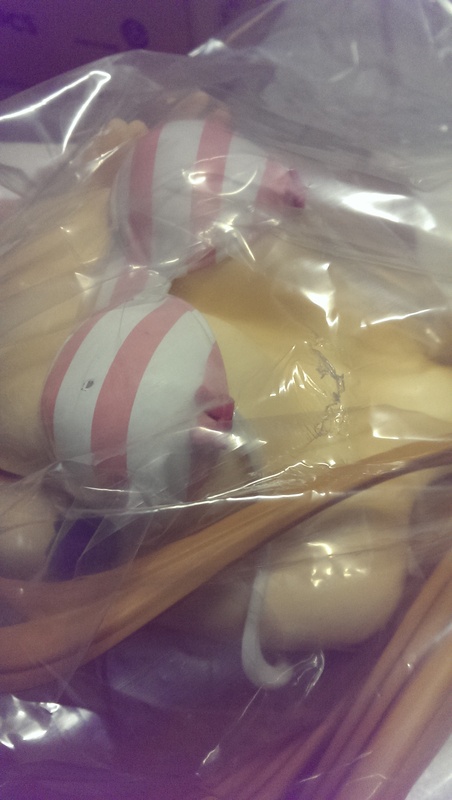 We have noticed many people who purchased the Kirino Kousaka: Cat Ear Swimsuit Soft Bust Ver. 1/2.5 Scale Statue have been experiencing similar issues with the figure. Unfortunately, it seems there may be a specific issue with the actual build of the figure. I have shared the information you have kindly provided us with the manufacturer for their consideration. Once we have received a definite answer from them we will write back to you immediately! If you fully insert the peg inside, is the arm slideable sideways? From what I see the hole on the external part is just enough fit for the thicker part of the peg. Anyway the white color on the peg looks something like an adhesive compound, it doesn't look like a broken piece judging from the color difference. But in case it is a broken part, i don't think you can fix that properly without disassembling the body. Nooope nothing like that at all, its weird. I hope something of that sort is the solution, but in the meantime I'll start preparing what I need to repair it with what I've got. To me, the "break" looks like a sprue tab was cut off and took a little of the material near the gate along with it. If there is too much play in the fit for superglue, then try epoxy instead. Just make sure to apply only enough inside the hole, so when you insert the other piece of the arm, the stuff doesn't ooze out the seams of the join. otani (Il y a 3 ans) #4389288This is an easy fix, you're not missing any part at all. You can just use a super glue to glue them together. You can put some on the red or blue parts which I drew. Or you can put some on both blue and red. No need to put frames or something like that. They're not articulated anyway. Just remember to not put too much glue since the glue will be spread out once you insert the pegged part and remember to put the glue a little farther than the exterior edge so that the glue won't slide outside and ruin your figure. As Limited said, with some drilling and a metal rod, you could try to make a connection between the arm and the inner frame. Limited (Il y a 3 ans) #4389242There wasn't a small loose piece anywhere in the box? I'd guess the arm either broke during shipping and the piece is... somewhere, or the arm broke during assembly and QC never checked it/didn't care. Either way, the main hope would be for the manufacturer to send you a replacement arm. This is an easy fix, you're not missing any part at all. You can just use a super glue to glue them together. You can put some on the red or blue parts which I drew. Or you can put some on both blue and red. No need to put frames or something like that. They're not articulated anyway. Just remember to not put too much glue since the glue will be spread out once you insert the pegged part and remember to put the glue a little farther than the exterior edge so that the glue won't slide outside and ruin your figure. xCommando (Il y a 3 ans) #4389198Ahh I see what you're saying.. I like that idea, it doesn't sound too messy. So then you agree, there does seem to be a piece missing? But if that's the case and it wasn't in the box...then maybe it was a manufacturing error..? There wasn't a small loose piece anywhere in the box? I'd guess the arm either broke during shipping and the piece is... somewhere, or the arm broke during assembly and QC never checked it/didn't care. Either way, the main hope would be for the manufacturer to send you a replacement arm. Limited (Il y a 3 ans) #4389188It looks like the arm had a double/stepped peg: a large peg that fits into the soft slot, then a smaller peg extending off of that which slots into what is probably a hard skeleton of sorts inside the soft body. But the smaller peg broke off, leaving you with only the large one, which has a poor hold since it only slots into the soft material. So any repair is going to need to bridge the gap between the arm and the hard skeleton. I can see repairing it by drilling into both the arm peg and hard skeleton, then bridging the gap with a metal rod. With the rod secured in the arm, building a pseudo peg of sorts around it using epoxy putty next. Finally, stuffing epoxy putty along the sides of the hard skeleton's slot before plugging in the arm. That would hopefully hold the arm in reasonably well, but it could break again if abused too much. Ahh I see what you're saying.. I like that idea, it doesn't sound too messy. It looks like the arm had a double/stepped peg: a large peg that fits into the soft slot, then a smaller peg extending off of that which slots into what is probably a hard skeleton of sorts inside the soft body. But the smaller peg broke off, leaving you with only the large one, which has a poor hold since it only slots into the soft material. So any repair is going to need to bridge the gap between the arm and the hard skeleton.